PlayStand is a CD player. You can play CD by simply putting the CD to a stand. PlayStand identifies an RFID tag embedded in a CD case and plays corresponding MP3 songs to the ID. With the video, you can quickly understand what PlayStand is. Usage of PlayStand is very easy. You can just put a CD what you want to play to the stand and music starts as well as lighting. When you take out the CD from the stand, music fades out and lighting stops. The mechanism of PlayStand is very simple. All songs in CD are stored in PC as a MP3 format in advance. Each CD case has RFID tag in it and an RFID reader behind the stand identifies the ID. Since IDs and songs are related in advance, PlayStand can play the appropriate MP3 when ID is identified. That's the way PlayStand plays music by "put and play". 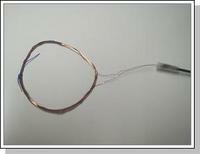 To identify RFID tag, we use a RFID reader developed by Michimune Kohno. To control lighting equipment, we use PICNIC. To control the whole system and play MP3 songs, we use PC. 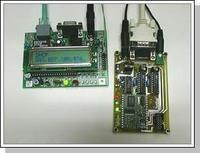 The device on the left-hand side is a PICNIC, and the device on the right-hand side is an RFID reader. We use an antenna with a diameter of six centimeters. 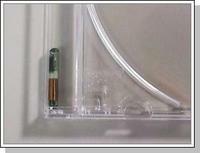 A RFID tag is embedded in a CD case. Its length is 22 millimeters. The idea of PlayStand was developed by Toshiyuki Masui . I developed PlayStand in cooperation with Michimune Kohno, and Koji Tsukada. National Museum of Ethnology has a system that displays illustrations for exhibited objects. You can simply put an object to a stand to see the illustration. ListeningStation is an audition system. You can listen to songs in a CD by showing a bar-code on the CD to the system. You can listen to music by uncapping "bottles containing music". When you cap the bottles, music stops.